I LOVE LOVE LOVE LOVE LOVE LOVE <3 cleansers. Oh man, I can't get enough of them. I just can't. I have a whole shelf in my linen closet dedicated to them. I try and get my husband to use them, but to no avail. I guess that it's a good thing anyways because it just means more for me! My favourite for a long time now is the H2O+ Sea Clear Mattifying Cleansing Mousse. But I ran out. As I only head out to Vancouver once every two years or so, I try and stock up, but I also know that it's not a good thing that have many bottles of this stuff just sitting there because it kind of separates and it's not cool looking at it and knowing that you're about to put this on your skin. So, usually, I'll purchase two or three bottles and I'll be done before I can get myself to Van again. Anyways, so, in between, I get to try many, many, many different cleansers. Usually, I'll pick them up at my local Sephora, or if I'm feeling a little hoity toity and want to pick up some CD or Lancome, I'll head to the Bay. Speaking of which, when did their shoe department turn fantastic???? Last time I was there, I walked out with three pairs of boots. Another place to add to my list of bad places to go if you're trying to save money. 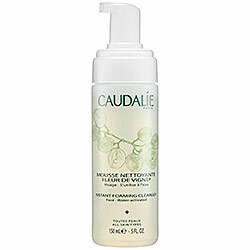 My last cleanser purchase from Sephora was a two-pack of the Caudalie Instant Foaming Cleanser. It was such a great deal, and I've been wanting to try this one for a while, so being the "I want the best bang for my buck" type of gal, I grabbed it. I mean, I have enough girlfriends who would be willing to take it off my hands if I didn't like it or if I reacted to it. I believe, when I purchased it, it was two bottles for $30? Sorry, I wasn't planning on doing a review, so I can't remember. If I stop by a Sephora, I'll make sure I pop in and get the price (if there's any left - I think that they were a limited time type of thing) I'll put the edit in. There's a really weird smell to it. It foams quite nicely, but not sure if it's enough for my taste. I like one pump to fill my palm. Okay, that totally came out wrong, but I'm sure that you get my drift. The smell was all weird. Like it's trying to be floral but it was a little stale. Stale stank. Or stale floral. I'm quite sensitive to smells, so it was really tough for me to finish these bottles. No, I'm not one of those who you can't wear perfumes around. I just really have acute smellers. I would say a bottle probably lasts me about three to four month (though, it seems like I've been using this forever). I only use this cleanser in the morning. Yes, there's a reason...not only is it good to mix up your cleansing routine, but because I don't think that this cleanser could handle a tougher clean. In the mornings, it's fine if it doesn't cleanse properly because there shouldn't much to have to clean. But at night....oh boy...this thing wouldn't stand a chance against make-up. It's just too light of a cleanser for me. I like being able to feel that my skin is clean. You know? The feeling where if you rub your skin, it'll make squeaking noises because it's so clean. Overall, it's a good cleanser and perhaps it's made for really sensitive skin. I wouldn't purchase it again. My girlfriend puts a travel size of this cleanser in her carry-on kit so if she has a long layover, she can still freshen up (coz we all know how great that recycled air is for our skin!). It's a brilliant idea, but other than that, once I'm done, I'm done. I guess I found someone who likes cleansers as much as I do !! I used to buy and love the Lancôme Mousse Clarté but it has been discontinued. Now I am gonna use some store credit to buy either the Lancôme Mousse Éclat, L'Occitane Immortelle foaming cleanser or this Caudalie one. I enjoy that squeaky clean feeling and rich lather.